More rain in the forecast is problematic for saturated soybean fields. 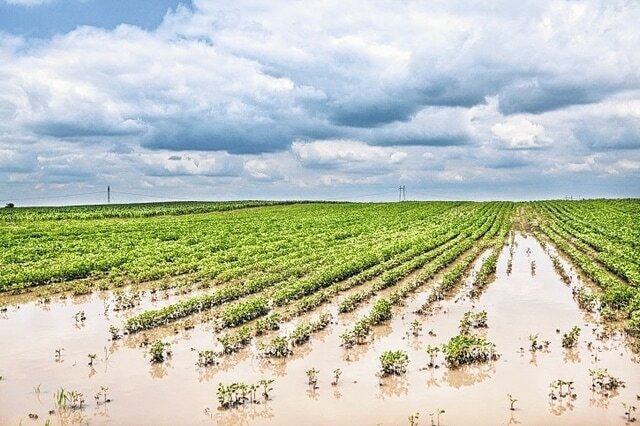 COLUMBUS – With many soybean fields across Ohio already dealing with wet soils from earlier rains, the flooding impact from the remnants of Tropical Storm Bill could leave some growers with diseased crops or facing yield loss. He added that the situation will probably get worse this weekend, June 20-21, because of the forecasts of additional rain. Heidlebaugh grows soybeans and says he will probably lose about 5-6 acres of his crop. “I am in a pretty flat area and not close to any river,” he said. He said the flooding was as bad in neighboring Van Wert County and those farther north. He said he is concerned about disease with all the standing water in fields. Growers with soybean fields flooded for six days could stand to lose up to 93 percent of their crops’ yield potential, said Lindsey, a soybean and small grains specialist with Ohio State University Extension. OSU Extension is the college’s outreach arm. In Fulton County, farmer Allen Willson has about a thousand acres of soybeans and more than a thousand acres of corn planted. He said Friday that he is seeing some “yellowing” of the corn because of the standing water in his corn fields and has lost about 10 acres of his soybeans to the flooding. “Rain? We have had plenty of it,” he said. Since the end of May, he said, there have been just a few days when he has been able to work his fields. “But I don’t think the rain has been as bad for us here than in counties south of us,” he said. Statewide, for the week that ended June 14, soybeans are 95 percent planted and 87 percent emerged, according to the May 26 U.S. Department of Agriculture crop progress report. That compares to soybeans at 92 percent planted at the same time last year, with 78 percent emerged during that same period, the USDA said. “Widespread heavy rains last week brought most fieldwork to a halt in Ohio,” the federal agency said in a statement. “Heavy rains through the state have brought many concerns for producers. “And, if the waters recede quickly and the plants receive some light rain, they can recover, but will probably still experience some yield loss,” Lindsey said. Other issues soybean growers can face as a result of flooding include:· Poor nodulation: Soybean roots have nodules on them that capture nitrogen that aid in the plant’s growth. Wet soils reduce nodulation and can result in yellow, stunted soybeans. · Disease: Flooded and saturated soil creates optimum conditions for water molds that are common across the state. Soybeans will have brown roots, sometimes with dark brown lesions on the roots, and the tissue can be brown to tan. “With high costs associated with replanting, most growers should carefully weigh all options before deciding to replant,” she said. “Growers have to weigh if the percentage of yield loss from the flooding will be greater than the potential yield loss associated with late planting.